I read a book today that I probably should have read forty years ago -- Eliade's The Sacred and the Profane, not the first book you'd think of in considering gentrification, but surprisingly relevant. It's mostly about the sacred, but he likes to insist that the non religious experience is -- well, he thinks it's informed by the religious, but I think that's a bit contentious; I'd settle for "analogous to" the religious. Among his examples: no matter how secularized you are, the place where you grew up holds a special significance for you, distinct from other, more mundane, spaces. It's akin to a sacred space. Eliade goes on to describe the religious experience of the home village as a kind of holy space; those who attack the home village appear to the religious as demons. In Manhattan, although the place where you grew up may be sacred -- or, at least, specially significant -- it's most likely either not there anymore, or if still there, transformed beyond recognition. Eliade doesn't attempt any analysis of the forces of the profane, but in the city you don't need to be a prophet to see them. They are developers, their political support, and all their minions from landlords on down, tagging along and swaggering around our mayor like the devil's entourage in The Master and Margarita, eager to ride the golden calf for a good buck. So many outside devils are invested in the sacred and profane ground of the city, it's hard to imagine keeping them at bay. And the spirit of the city, even that ground itself, seems to reject roots. It's not enough to preserve the sacred places -- brash new renters rush to fill old, storied buildings here. It's not enough to preserve the community -- communities themselves transform occupationally, educationally, economically and culturally in this fluid ecology. What needs preserving in a city is the sense of place. Later on in his book, Eliade describes initiation rites through which adults enter into a sacred relation with their environment and learn the true names of the deities. In the city, even these names are easily hidden. They are the names of the families who lived here, of the communities who built here, of the artists who created here, of the children that grew up here. Who remembers them? History in Manhattan wanders the streets like a phantom unseen, unheard, unnoticed, except by the occasional flaneur, the ghost-seer who posts on his blog the latest loss of yet another sacred place, unnoticed by the armies of the profane. I am continually impressed with the sense of place among the residents and former residents of Chinatown. Of all Manhattan, Chinatown may retain the strongest sense of place. It is a world apart from the rest of New York, not because it is an ethnic enclave, but because it is a space that still belongs to the community that lives there. But it's a community divided between ownership and labor. I wonder how long it will last. Upscale nightlife locations serving a non local patronage are popping up in the heart of Chinatown; local businesses, having trouble keeping up with rising real estate values, are giving way to chain stores; swank hotels are replacing residential and office space, displacing the local community. Can the Chinatown Working Group come up with a plan to protect Chinatown from real estate speculation? Can the group forge a coherent vision for the future of Chinatown that doesn't repeat the failures of every other Chinatown in the U.S.? The question may be answered on Monday when the business and development interests meet with the preservationists to figure out how to keep the economic investment engine that has driven Chinatown from bulldozing Chinatown. The future of the Chinatown Working Group process and of Chinatown itself depend on whether the conflicting needs of economy and of community and culture can be addressed. -- a joint meeting of the Economic & Transportation Teams with the Zoning & Cultural/Historic Preservation Teams to discuss their respective goals and vision and to share their expertise in preparation for a town hall on CWG plans for Chinatown. the way to Sheldon Silver's heart is through his loyal voters. Bring the Grand Street community to the table and you may be able to sway the old man's mind. He'll still be wary of building housing that will bring to his district new voters with no loyalty to him, but if you give him a leadership role in creating the housing in SPURA and spin him as the hero, he might feel ready to go for it. The Grand Street residents want to add a little spice to their neighborhood, a little action. A movie house, a theater, a sports complex, a few cafes, a couple of bars and restaurants would add value to their real estate. Right now the place has all the charm of a sprawling assisted living facility. Find out what they want and see if you can create it for them and still get what you want too in the deal. Books Through Bars (no, not local bars -- prison bars) is holding Bingo Night to pay its way: ABC No Rio (156 Rivington St), Friday Nov. 6th at 8pm. Remember that a huge number of kids from this neighborhood were carted off to prison under Giuliani in the 90's to serve draconian prison sentences just when educational tuition assistance for prisoners was ended. Our prison system no longer even pretends to rehabilitate. Long-term incarceration under the Rockefeller Drug laws was just a convenient and politically expedient means to feed a dead upstate economy with prison construction and maintenance -- political patronage, while our neighbors' kids still languish in cells. Read more about the state of education in prison and its importance from the Village Voice and the Correctional Association report here (scroll down the CA page) and press release here. Books Through Bars is out of money, so we're playing cheap/fun/awesome Bingo to pay for postage and keep sending packages full of books to folks incarcerated in America's broken prison system. NY Adorned Tattoo Shop, Bluestockings Bookstore, Le Poisson Rouge, St. Marks Bookshop, NYC Hall of Science, the Angelika, IFC Film Center, the Beehive Collective and much more. ABC No Rio (156 Rivington St), Friday Nov. 6th at 8pm. The NY Times election analysis map shows that the Lower East Side still retains its distinctive spirit in a city elsewhere divided by race even more than by income. The Times comments: "The mayor did well in high-income white areas of Manhattan and Queens, and also in election districts dominated by immigrants, like Flushing and Brighton Beach." Add Chinatown to that list. "But his vote fell sharply in black neighborhoods, especially southeast Queens, where the black middle class has been hard-hit by foreclosure." Tagging on the last post, if the police cabaret units are, as one bar owner described them, "a bunch of goons going around harassing people" (quoted in the Lo-down), that's something the community board ought to address. But the way to address it is not to lower the priority of funding the enforcement of laws designed to protect the public from an industry that disturbs the local public. The officer who drops by to ask a bar to lower the speaker volume has no effect. As soon as he's gone, the volume ups. Fines are the only disincentive. One commenter notes that having crowds (well, to be fair, she said "people") on the streets enhances the safety of the neighborhood. Good point. But there are, aren't there, safe neighborhoods without bars? My street has none and people seem to feel safe. The safest neighborhoods in the city have none (5th-MadAve-ParkAve; Shelly Silver's hood on Grand Street; suburban spreads in Queens and elegant enclaves of Brooklyn). Clearly the question is how to have a safe neighborhood that's also interesting. I'm not convinced there's any answer to that. When this neighborhood was most interesting, it was, sadly, most unsafe. That was true when it was the home of punk rock, the graffiti generation, the beatniks, the German anarchists. Surely the ideal answer to crime is not transforming your neighborhood into a bar destination, driving out all the old local businesses, drawing in an upscale crowd that raises rents and incentivizes landlord harassment of tenants. That's selling the farm to save -- what, the path to the front door? I set aside the question of whether the streets are truly safer in the wild nightlife zone or only appear safer. Bob Arihood thinks the bar scene brings violence, and Bob should know: he documents it. There's a difference between an unsafe street and a scary street. Scary isn't necessarily unsafe. Unsafe might not look scary. For me the bar question is about gentrification, rising real estate values, displacement; about creating a community that has some depth and interest beyond the mainstream blandness that Jeremiah burlesques so mordantly on his blog. Bars have always had a place down here. But the scene was so different. And that's the real problem and the reason the re-election of Bloomberg is so unfortunate. Most of the young people I know here have no idea of what life was like in the LES thirty years ago. They can't imagine the fluidity of the spaces, the freedom, the intimacy of the neighborhood. All they can imagine is the danger, the craziness and the hardship. But it was also easy to live here. It was cheap. There were no roof alarms; missing your rent by a few months was no big deal. That's a life that has disappeared with the density of the new city. It's too bad. Manhattan always had pockets of alterity. South of Washington Heights, there's only Chinatown left. I don't blame bar owners for wanting the police to quit ticketing them. But how could the Community Board buy the argument that ticketing bars threatens the economic viability of the Lower East Side? How many bars have been closed by excessive ticketing? Any? CB3's priorities support deregulating bars -- police enforcement was the only tool regulating bar excess. CB3's capitulation doesn't protect a needed business, it merely adds profit to an already profitable business of questionable value to the community and of known harm. Is that the CB's role -- to hand more money over to a business that isn't in trouble, at the expense of regulation and the well-being of residents? No doubt the bars have raised real estate values in this neighborhood, both commercial and residential. In fact, the creation of destination nightlife has skyrocketed real estate values and undermined commercial and residential stability. What have bars done for our community but gentrify it into an overpriced, overhyped destination for transient children of wealth? Does that build community or destroy it? The tax revenue generated by the bars does not come back to the neighborhood. It goes to the city. And the reason the bars are "the only industry we have down here" is because the bars have driven out everything else. CB3 members, you have brains. Use them. Every Sunday afternoon, returning from Chinatown, I pass through the southwest entrance of Tompkins Square Park and there, always and reliably, seated at the edge of the first row of benches, often alone but often accompanied by Phil Van Aver, another long-time resident from around the corner, would be Miriam Friedlander, every Sunday afternoon. She was slight and a bit frail but seemed happy. I'd join them for a while, shooting the breeze about politics in the present and the past, on which she always had much to say and much worth listening to. And always radical, surprisingly radical. Her seat is now unclaimed though not unoccupied. Each week another face appears there, young or old, no doubt unaware whose seat it was, or that it was anyone's, or that someone passing by might expect to see anyone there but themselves. As if she'd never been there at all. The harassment of tenants by landlords is widespread in New York. It is encouraged by city agencies under the mayor's direct control. The Department of Buildings no longer enforces its own regulations, the city does not collect DoB fines; meawhile Bloomberg continues to defund it. Without funding or the ability to levy and collect fines, the DoB is helpless to prevent developers from abusing tenants. New York is all about real estate speculation. If you want to know who this mayor is and what he's all about, look at the DoB, the department of development oversight. It is a bankrupted agency. It bears the true profile of our mayor. Tenants have been evicted and are in the process of being evicted on my block through landlord harassment encouraged by the failure of the DoB. I hear similar stories from all over the city. I'm sure you have too. I can think of no better reason to vote on Tuesday. About a dozen suits from educational institutions met today at P.S. 64 (formerly El Bohio, site of Charas), all prospective tenants. Is Singer moving ahead with a dormitory? What happened to all the community plans for the building? Curbed and the Real Deal report plans for a 27-story hotel/condo complex on the Bowery just south of Canal Street, next to the old Citizens Bank (now HSBC). The historic Bowery Theater once stood on this site, the city's largest and most influential theater, where T. Daddy Rice introduced the blackface character Jim Crow in 1832, where Frank Chanfrau created Mose, the Irish gang-hero, where Thomashefsky first performed Hamlet in Yiddish. Now it's a Duane Reade. What will this 27-story hotel do to the Chinatown neighborhood? Look at what the 22-story hotels in the LES did to Orchard and Ludlow. I'll be speaking at the Muste Institute this Saturday on how recent city administrative policy has divided neighborhood activists, undermined resistance to gentrification, and weakened legal recourse and government protection of the public interest from private incursion. The event is free and open to the public. Children are welcome. Light refreshments will be served. BAN's town hall on the future of the Bowery drew a large crowd of eighty or more -- impressive for a community meeting. Everyone, both from the dais and from the audience, spoke in favor of BAN's plan to save the east side of the Bowery by simply extending the current zoning protections of the west side of the Bowery over to the east side. Councilmember Alan Gerson, who is running for re-election in the district, helped BAN set up the meeting and co-chaired it with local zoning expert Doris Diether. Gerson made clear his support for preserving the Bowery and, pressed on the issue by a member of the Little Italy Neighborhood Association (LINA), committed to coordinating the effort at the political level. Margaret Chin, once again running against Gerson, also appeared in support of the BAN plan, as did a senior aid of Pete Gleason, the dark horse in the campaign who is garnering attention and interest as the candidate with the least political baggage and obligations. Community Board 3 did not attend the meeting even though the area of the Bowery in question lies in Community District 3. Jim Solomon, however, of Community Board 2 and the Chinatown Working Group co-chair, did attend. The director of the East Village History Project was there, the JASA residence was represented and the Bowery Mission, among a wide array of local residents and community organizations. Councilmember Gerson will be instrumental in the upcoming meeting with City Planning. It's fair to say that the future of the Bowery depends on the work Gerson can accomplish between now and that meeting. NYC Council Member Alan J. Gerson invites you to a Stakeholders’ Meeting to consider a plan being put forward by the Bowery Alliance of Neighbors, which would create a zoning text change to protect the diversity and heritage of the east side of the Bowery. Gerson’s office has worked together with the Bowery Alliance of Neighbors to bring together the Bowery Community–residents, building and business owners, and community groups–to determine how best to preserve the integrity of this important crossroad of New York City history. We invite you to join in this process by coming to the meeting, learning about the plan and offering your input. We are holding this stakeholders’ meeting in advance of a meeting with the Department of City Planning, where the future of this historic area will be discussed. Since the Department of City Planning has excluded the east side of the Bowery from the East Village/Lower East Side Rezoning, the low-rise, historic character of this district is being replaced by high-rise dormitories, boutique hotels and luxury buildings, which are out of scale with the surrounding residential community. The current overbuilding impacts the communities of Chinatown, Little Italy, the East Village and the Lower East Side. We, as a community, must come together to protect the east side of the Bowery. A big turnout will help to ensure that this issue will gain the attention needed to protect our community. We look forward to seeing you at the the meeting. The Bowery Alliance of Neighbors (BAN) is proposing that the east side of the Bowery, from 9th Street to Canal Street, should be rezoned to ensure that it is in line with the rest of the community–the Special Little Italy District, the NoHo Historic District, and the East Village/Lower East Side. Since the buildings on the east side of the Bowery are comparable to those on the west side, it is logical to have the same regulations that are already in effect on the west side. This would limit the height of the buildings to 85 feet, or eight stories, and would protect buildings of special significance to prevent their demolition. This plan will protect the current residents and businesses on the Bowery and ensure that the restaurant supply, lighting and jewelry districts will continue to be a presence in New York City. Our Community Board has sent around a notice asking for help in getting themselves more funding. But CB3 did not send around a notice announcing the Chinatown Town Hall, an extremely important community event held in CB3's district. It has been eleven months that the Chinatown Working Group has been meeting, yet CB3 has not sent even a single notice of even one meeting. I get my notices of Chinatown Working Group meetings from CB2, even though I live in CB3's district and the Town Hall was held in CB3's district. No doubt the community boards need funding to accomplish their goals. But those goals must include the entire community, not just the sector of the community that makes the CB look good or that is friendly to the CB. Advertising the Chinatown process would have improved CB3's image. Continuing to undermine the process by not sending out notices will just earn CB3 more enmity. I hope CB3 will rethink its approach to the Chinatown Working Group and begin sending notices of the meetings through their e-mail list. Then I might be happy to advocate for more CB funding. Save Ray's: Come one come all!! to help Ray pay his fines and do some renovations. If you love Ray and want to help him, come over. A while back I was asked to write an introduction to a book on LES history. Unfortunately, after it was all written, the publisher asked us to cut out several thousand words, so now there's a very brief published intro and a much longer unpublished one. I thought I'd serialize the original introduction here. It's a romp through the history of Manhattan from the perspective of its slums, a rich and surprising story, with great significance for the history of the city, the nation and, in fact, the world: the New Deal welfare state emerged from the slums of New York, and the welfare state has become the socio-economic foundation of industrialized nations the world over. If you've read the standard texts, Anbinder, Burroughs & Wallace, Riis, Sante and Shorto, you'll recognize many of the details. It's an intro essay designed to entertain, not a piece of original research. The book itself, by Eric Ferrara, contains a wealth of original research which cannot be found all compiled together anywhere else: Gangsters Murderers and Weirdos of the Lower East Side. "I can lick any man in the House" thumped a braying John Morrissey, twice holder of the American bare-knuckles boxing championship, Dead Rabbits gang leader and the man who, after losing a humiliating fight to Bill the Butcher, ordered him murdered. The "House" he mentions was not a local saloon. It was the United States House of Representatives, a gang to which Morrissey -- boxer, gangster, murderer -- had been elected, not once, but twice. Politics was a violent affair back in the mid 19th century, especially in New York, which was a violent place. The country was expanding into lawless frontiers and fighting over them in the hills and fields and in the halls of Congress too. The country was itself a kind of frontier, learning to define its laws and learning to abuse and subvert them once defined. Even more astonishing than the scale of 19th century corruption – government is always corrupt on the largest possible scale -- was its acceptability. In his half-serious distinction between honest graft and dishonest graft, as if graft itself were no wrong, only lying about it, Tammany Hall's George Washington Plunkitt offers a blunt clue: "I seen my opportunities and I took 'em…What's dishonest about that?" Politics was unabashedly criminal, and unabashed criminals became politicians. In New York, it was not uncommon for candidates to rise from the ranks of the gangs. The relationship of the 19th century gangs to the city's politics reflects the broad history of post-Revolutionary New York and its emergence in the 20th century, after a hundred years of struggle, as a progressive vanguard for the nation. Early 19th century New York was a world in rapid transition towards industrialization, succumbing to the depressed wages and social instability that industrialization brings. Pre-Revolutionary New York had been a wealthy port with a stable, if uneven, social fabric of lavishly aristocratic landowners surrounded by modest artisans and "mechanics," the highly skilled laborers who, through the traditional artisanal guild systems, regulated prices and wages. It wasn't always smooth, but it was a kind of communal society -- albeit with an extravagant top end --tacitly governed by a communal ethic, with a grousing recognition from the heights that no part of an integral society could be entirely neglected. When industrialization arrived, it marched over Manhattan with little regard for its quaint integrity. Industrialists quickly saw the advantage of unskilled labor over these high-cost craft masters supporting their live-in apprentices. Industry needed a limitless source of such labor to replace the artisan and drive wages down. That source was handily offered by the tens of thousands of impoverished and desperate immigrants flooding the New York port in search of a start at the very bottom. And that's exactly what those immigrants got, although the bottom had dropped much lower than anyone had ever thought possible. This was a perfect marriage of convenience for industry, the well-appointed groom, although it did little for the underpaid immigrant labor force wedded to him, less for the jilted out-of-work artisans. For society as a whole it was a disastrous union, unstable and antagonistic from the start, eventually ripping apart that precarious communal social balance, finally throwing the city's politics into confusion of spite, brutality and rapine. In a true oligarchy, labor has little recourse against wealth in power: wealth rules. But in a democracy, the industrialist is not the only card sharp looking for a good game. Politicians play too, and often deal. Their game, moreover, is indispensable to the industrialist. The government builds infrastructure – like the Erie Canal -- that can send young industries into boomtime. The politicians are suitably positioned to speculate on the future they are themselves creating, and take a kickback as well. There's not quite as much money in politics as industry, but there's plenty. All the politician needs is a limitless source of voting support. And so New York became a battleground between wealth and political power; on the one side the industrialist, intent on immiserating the immigrant to keep wages low, and on the other side, the political clout of the sheer numbers of immigrants cultivating their local favorites as candidates. Wealth had created its own worst enemy, a vast working class. Industrialization, without intending it, had pushed New York into political transformation. It played out at first in Tammany Hall graft and deadly riots, but eventually gave us a successful labor movement and the New Deal. It all started with the gangs and the gangs all started with Five Points. No place on earth perhaps has had so bad a reputation as Five Points. Considered both unreformable and unworthy of reform, it was razed to the ground in the mid 1890's, and, as if eliminating it were not enough, all the streets leading into it were renamed over the years erasing every evidence of its existence from the map of New York. Today, finding the site of Five Points requires either a bit of preparatory research or a good tour guide. The neighborhood got off to an inauspicious start. It was first an undesirable marshy spread to the east of Manhattan's largest lake, called by the Dutch the "Kulch" and bastardized by the British as "The Collect." Today Foley Square and Collect Pond Park cover the lake site. You can still see the water's outline: nothing tall is built where the lake was; the municipal skyscrapers, defining its solid-ground shoreline, stand hovering over the empty square. The British name was unwittingly prescient. The lake, originally 60 feet deep, rife with fish – it was a favorite Dutch recreation area – began to collect waste as tanneries and slaughterhouses sprouted around its shores. It grew so polluted that it was used as a local dumping ground with garbage, according to at least one account, rising fifteen feet above the water level. The exaggerations of the contemporary appalled aside, the putrid mess became an issue for the city, not because it was unsanitary, stinking and infested with vermin, but because it drove surrounding real estate values down, real estate being a matter of genuine municipal concern in a city owned and run by its landed gentry. Digging a canal to drain it (today's Canal Street), did nothing to quell the aquifers that fed the lake, and so a nearby hill, New York's Bunker Hill which rose over Broome Street, was shoveled into the watery pit, creating a landfill, though not what you could call dry land. It was more marsh. Undaunted by the challenge of constructing over waterlogged land, real estate speculators, among them John Jacob Astor, wealthiest man in America, bought pieces of this worthless swamp for a song, renting it out to contractors who built ramshackle shacks there, not for themselves to live in – who would choose to live in muck and slime – but for those who could not choose to live elsewhere, the greenhorn immigrants clambering off the boats with not a penny in their pockets. The immigrants were perfectly suited both to fill the shacks and work the factories, enriching both landlord and industrialist. They should surely have been welcomed for all the wealth they brought their superiors, but they were despised instead, as if keeping them in penury were easier to conscience if it were viewed as a sort of punishment and just desert. The German immigrants were deplored -- and feared -- as dangerous revolutionaries, the Catholic Irish reviled as subhuman brawlers. Newspaper cartoons – the news industry was Protestant-run -- consistently draw the Irish with simian features. Rents, you'd think, would have to have been cheap, since these immigrants earned so little. Such an assumption woefully underestimates the robust vigor of irrepressible American entrepreneurial spirit. Rents outcharged the immigrants far beyond their capacity to pay. It was up to the renter to take in boarders -- whole families of boarders, and, if there was a tiny windowless closet of a backroom, as many as would fit who had a penny to pay. It is a tribute to this great American spirit that a once empty, worthless swampy dump could be transformed into a rich source of regular revenue, nevermind that it was dense, diseased and desperate beyond anything anyone had ever seen or imagined. Exploitative real estate in the slums was so lucrative that the shacks were built with upper stories to expand rental space. Thus was the multiple dwelling conceived, profit being the mother of invention. Tenements couldn't be built high enough. At the time, the standard of housing elsewhere in the city was the town house. All the wealthy lived in them and the artisans too, along with their apprentices. Apartments wouldn't come along until the French made them fashionable later in the century. Boarding houses there were, but the tenement apartment belonged to the slum, considered unfit for any but alien laborers below the level of social inclusion. They were built taller than the standard townhouse, almost twice as tall, among the tallest structures in the city. The oldest tenement still standing, on Mott Street, is no less than seven stories tall, and no elevator. In an age without the mechanical lift, well-heeled businessmen would not consider climbing more than a few flights of stairs. The great business establishments and the great businessmen's great mansions were broad and expansive, not tall. But no thought was given to immigrants living even seven stories up, taking those flights several times a day, since without refrigeration, merely eating required a trip downstairs to the street carts. This was the context of immigrant life: housing without running water or toilet facilities – the toilet was a ditch in the back yard – no sewage system, streets piled with garbage, pigs the immigrants couldn't afford to feed running wild in the streets alongside the thousands of abandoned children the immigrants also couldn't afford to feed, and the prostitutes, prostitutes walking the streets, prostitutes waiting in the doorways, prostitutes reclining on the steps, prostitutes everywhere. It was estimated that a third of the female population of New York in 1840 was or had been engaged in prostitution. And no surprise: a seamstress might earn between one and two dollars a week, working sixteen hours a day seven days a week; a prostitute could earn nearly twice that in a day. Every second or third house in Five Points had an accommodation for prostitution of some kind. Nearly every building on Anthony Street between Centre and Orange housed a bordello. If prostitution was nearly everywhere, alcohol was absolutely everywhere. Every building had an accommodation for whiskey. All the early renditions of Five Points show groceries, a euphemism for groggeries, in every house. Whiskey was the cheapest drink on the street, cheaper than tea, cheaper than coffee. Drunkenness was a genuine and pervasive problem for the slums, contributing to child abandonment as well as compelling children to runaway, no longer able to endure the abuses of irascible parents unhinged by liquor. This backdrop of whiskey pouring into every corner of the neighborhood softens the image of the temperance movement. Teetotalers might have been extreme, but they were responding to a genuine reality. 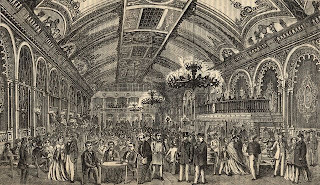 The saloon became one of the two centers of social life in the slum. The saloon owner, a man of the people, though a few steps above in income, became the local leader, trusted, respected and relied-upon. He was equally connected to a powerful industry, liquor, and to a broad constituency, the neighborhood. He could hide a local gang member in trouble with the law; he could help him out with a small loan in a pinch. The slum invested its political strength in the saloon owner and the list of saloon-owner power brokers in New York is a long one. The collusion of politics, saloons and gangs was evident from the beginning. Political ringleaders, like theatrical impresarios, staged gang riots as today's activists stage demonstrations. The source of their influence was not in the low-level offices they occasionally held, alderman or district leader. They typically operated out of a saloon, the center of gang activity. To appreciate the influence of the saloon owner, just walk over to New York's civic center. Surrounded by the palaces of municipal authority and splendid marble courthouses lies Foley Square, named after "Big Tom" Foley, a saloon owner. Big Tom's greatest gift to New York was promoting his protégé Al Smith, New York's greatest governor, through the ranks of Tammany Hall into Albany. It is a testament to the power of the saloon that while the impressive civic center square bears Foley's name, the monument to the great Al Smith is shunted far to the east on Oliver Street amidst a nondescript affordable housing project, the Al Smith Houses, built over what was once the worst slum complex in the city, Gotham Court. Scarcely a New Yorker has not walked through the saloon-keeper's square; scarcely a New Yorker knows where to find Al. The political influence of this gang-and-saloon working class cannot easily be overestimated. Tyler Anbinder, in his study, The Five Points, describes the old caucus method in New York's primaries: candidates appeared at the party hall with their gang of choice; they fought; whoever was left conscious after the brawl took the nomination, all possible objectors having fallen silent for the evening. Candidates employed gangs to scour the graveyards for the newly inscribed tombstones of the recently interred: they would be the voters in the next election. In one election in the Tenth Ward, there were no fewer than 2,000 more voters than living inhabitants. Sly critics liked to say that Fernando Wood, the controversial Democratic mayor and champion of the working class and Irish, was elected by the unanimous vote of the dead. Repeat voting was another familiar scam. There was little risk of being caught: the polls themselves were guarded by the gangs. Wood, running for a second term, gave his police a furlough on election day, advising them not to visit the polls except to vote, and promptly drew out his Irish gangs to keep out Protestant Republican voters. Politics was a central concern among the gangs. The gang member of old New York may have been violent, but he wasn't a criminal, or, just as important, didn't imagine himself a criminal. The gang was a kind of social-civic organ. Gangs of the mid-19th century share fighting bravado and territorial pride with our contemporary notion of a gang, but little else. New York's volunteer fire departments were filled by local gang members, intent on demonstrating in as heroic and masculine way as possible the mettle of their civic virtue, their protective dedication to their own community and their indispensability to the city's welfare. They dressed up proudly too, in flashy outfits with ostentations hair-dos – permanent locks drawn forward around the cheek bones and held in place with soap, "soaplocks." They imagined themselves young men-about-town (though their bright-hued gear drew frowns of disapprobation from the rich, dignified and colorless). They were proud of themselves, of their ethics, their civic devotion, of their brotherhood. When they went to the theater they cheered the character of Mose, gang member, fireman, defender of the innocent and helpless from the predatory rich, and nemesis of thieves and lowlifes. Mose, the noble working man hero, was their self-identity. In the case of the Five Points gangs, these were Irish Catholic immigrants anxious to prove themselves every bit as American as the native-born Protestants who hated them, who hated their presence and who hated their damaging effect on wages, on the decline of skilled labor and workplace conditions. The Protestant gangs formed their own party – the Know-Nothings – while the Irish stood behind Tammany Hall's Democratic machine. It is the remarkable legacy of the gangs of New York that a city entirely owned by industrialists and landlords whose wealth and power drove a nation, became a working class Democratic town. The other center of working class social life was the theater. The wealthy had their parlor pianos; the working class had theater. The halls built to house the stages were immense, holding thousands. The Bowery Theater was built for 3,500. No other indoor spaces in the city could accommodate such crowds. Theater took the place of the town gathering, an alternative to the town hall; the gangs flocked to the theaters and rallied there. At a time when life was far more social than we, sitting in front of our computers, can imagine, the theater was the bonfire that drew all around it. Theater was so popular that even the abandoned slum children formed their own theater on a little strip of Orange Street (now Baxter Street) just south of Little Anthony Street (now Worth Street), today covered by a pristine post-Modern courthouse. It was no mean entertainment. Eventually one of the city's hottest tickets, it was visited by the Grand Duke of Moscovy on his American tour, and called thereafter "The Grand Duke Theater." Legendary performers of early vaudeville got their start at the Grand Duke. Harrigan and Hart, fathers of the American musical, held annual benefits there. Theater back then had little in common with theater today. You didn't buy your ticket to sit in your seat attentively, waiting until the end of the first act to applaud. Theater was a form of self-expression for the audience every bit as much as for the actors. Catcalls, cheers, jeers, howling, booing, jumping onto the stage, sometimes crowding onto the stage -- even fights and riots -- were all a part of the evening. Peanut shells or rotten food were thrown onto the stage and the actors, often drunk themselves, played to the audience for cheers. The noise and mayhem must have been thrilling and frightening, with such large, unwieldy crowds stirred up into excitement and often anger. No wonder some of New York's most violent riots occurred in, at or around theaters. Nor was the stage the only focus of attention in the theater. In the recesses of the uppermost balconies, the prostitutes plied their trade. Theater owners encouraged whorehouses to open nearby – good for business. The intertwining of the red light district and the theater district is no coincidence. It's all entertainment for the evening in a male-oriented society; the owners and purveyors of popular distractions aimed to please. For the wealthy, the Five Points itself became an entertainment, a curiosity. The slum was so shockingly poor and the people so far from the dignified standards of propriety, that the genteel were given to junkets in among the slum dwellers to see for themselves "how the other half lives," the phrase reformer John Griscom coined in describing Five Points in the 1840's. No one had ever before seen or imagined such sordid loathsomeness, such moral abandon, such anarchic criminality, such filth, and perhaps most disturbing of all, such uninhibited racial mixing. White women could be seen in the arms of black men in the African quarter, a little alley known as Cow Bay between Centre and Orange (today's Baxter) Streets where the Lefkowitz office building now stands. Although slums are typically self-segregating, and Five Points was no exception – there were streets divided between the counties in Ireland from which the immigrants came – there is also mixing around the margins of slum society. In Five Points it was Irish with African, Chinese with Irish, later Jew with Italian, leaving the erect Protestant elites to choose their careful unions amongst each other, while still allowing themselves the occasional titillating thrill of peeking at the slum. The neighborhood's renown as a human freak show was not merely local. Five Points was known throughout the country; word had even spread abroad. Guidebooks devoted whole sections to its dangers and dark crimes, its unsavory natives and to the noxious place itself, with titles like "The Nether Side," "Sunshine and Shadow," "Lights and Shadows," and "The Dark Side." From afar and abroad, the great and famous, expected by their audience and fans to pass judgment on this extraordinary American city -- overflowing with wealth and holding the financial and industrial reigns of power in shipping and railroads and trading and banking, this metropolis so important to the country and so bluntly different from it -- the great and famous could not fail to take in the slum on their tours of New York. Davy Crocket came to visit – the country boy was appalled – and Charles Dickens, more familiar with desperate slums in London, came to compare. Dickens, whose literary responses leaned towards the colorful extremes of denunciation or enthusiasm, found fare for both in Five Points. His response to the slum dwellers is damning. He imagines that the pigs in the slum must wonder "why their masters walk upright" and "talk instead of grunting." 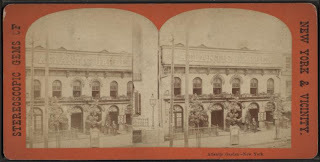 But he also visited Almack's Dance Hall on Orange (Baxter) Street near Bayard, roughly where the Columbus Park pavilion now stands. There he saw the greatest dancer of his time, William Henry Lane, known as Master Juba, who invented a dance so fast, wild and electric that, as Dickens writes, it brought "new brightness in the very candles." It was tap dance. Despite its curiosity and color, conservative Republicans still deplored the slums, blaming poverty on the slumdwellers themselves, while progressive Republicans tried their best to reform the poor, as if Catholicism were a disease and Protestantism its cure. The Children's Aid Society even cooked up a plan to wean the children away from their Catholic parents, sending them as unpaid labor to the age of eighteen in the Midwest, where the agrarian economy was starved for cheap labor and, equally important, there were no Catholics. It was a great success, from the reformers' point of view, and set forth a persuasive argument against the eugenicist insistence that the poor were doomed by nature. Stealing children from their parents seems barbaric today, but by 19th century standards, it was radically progressive: simply taking the child out of the slum will suffice to take the slum out of the child. Having completed their service to the frontier economy, the children were freed to pursue their lives, often achieving success. Today, New York City, under the draconian Rockefeller Drug Laws, sends its unwanted slum youth into permanent, life-long incarceration upstate, where the depressed economy depends on prisons. What success is theirs remains behind thick walls, steel bars and slamming doors. Not all change is progress. From the 1840's on, the battle raged between the Protestant industrialist owners of the city and the immigrant – and largely Catholic – working class gangs. The immigrant cause advanced with the election of Tammany Hall Democrat and working class champion Fernando Wood, only to see the jealous Republicans, in control of the state government, undermine him from Albany. In 1857, while Wood was impressing both the downtrodden in the slums and wealthy progressive reformers with his programs to fight poverty and provide respectable employment – eighty years ahead of the New Deal – Albany conspired to shorten his mayoral term and replace his entire police force with a new one of their own. Standing firm on his city support and refusing to disband his municipal police, Wood forced a riot between the two police forces on the steps of City Hall. The military intervened to issue the mayor a summons at bayonet point and arrest him for inciting the riot. The rest of the summer saw these two police forces engaging and subverting each other, turning the city into a lawless battleground. Tension broke into mass violence on July 4th, always a testy moment in the sweltering heat of midsummer New York. Responding to an incident in a bar on the Bowery, the city's busy commercial entertainment district, police and Protestant gangs attempted a full-scale assault on the Five Points, the Irish residential quarter, where the gangs and their families lived. Entering at Bayard Street, they attempted to push through the center of the neighborhood. Pelted by brickbats thrown from the rooftops, the invading Protestants were held at a stand-off. They piled up makeshift barricades out of carts and barrels, and brought out their firearms. By the time the military arrived the next evening, at least twelve were dead (perhaps many more dead had been carted away by family and neighbors), and both sides had exhausted themselves. The Times called the Protestant's invasion a riot and blamed it on the Irish. Worse riots were on their way. When, during the Civil War, Lincoln imposed a draft and allowed the wealthy to evade it for a fee (intending both to assuage the rich and raise funds for the war effort), the bitterly oppressed New York working class revolted. The draft riots of 1863 unleashed a fury of retribution expressing, especially among the long-abused Irish, decades of rage, lashing out in all directions. Four days of rioting, looting, lynching and arson shoved the mirror close to the city's face. Towards the end of the century, political clout shifted from within the residential wards to the Bowery itself, lined now with flophouses, burlesque 'concert' halls, saloons, gambling parlors, beer halls, restaurants, pool rooms, theaters and sensational curiosity museums cheek by jowl with prosperous immigrant banks and insurance companies, radical labor union halls and early Marxist workingmen's associations. In its bars Tammany sachems rubbed elbows with their working-class support while unions organized in Bowery halls for the eight-hour day. The gangs fought over turf. Following the Panic of 1873, the suppression of workmen's rights in the Gilded Age and reactionary fears of a rising immigrant labor force in New York, Bowery culture and business suffered. The erection of the elevated train, the "El," in 1878, casting the entire street into the shadows, sealed its prospects. The street declined. Meanwhile, the neighborhood to its east, known as the Lower East Side, became the new immigrant slum as millions of Jews and Italians filed into its tenements. Their gangs now took the place of the old Irish and Protestant gangs as they fought over control of illegal rackets. Legitimate political control of the city now belonged to the Irish, the underworld to the new immigrants, and the role of the gang evolved closer to the Prohibition-era bootlegger and racketeer we know so well. In the 1880's the neighborhood underwent a sweeping transformation. Italians filled the tenements of Five Points while Eastern European Jews swept over the wards east of the Bowery. The slums expanded all the way up to 14th Street and new slums emerged in Harlem. Violence took on a new shape and a new role reflective of the new immigrant cultures. Unlike previous immigrant groups, the Italians maintained a close connection with the home country. It was common for Italian men to spend only a few years in the New World before returning to the Old with a bit of good American cash. Where the Germans, here for the long haul, built union halls and social halls to protect and promote their community, the Italians established no-interest "banks" where immigrants could store their money temporarily for the purchase of a return ticket home, one of the staple services these "banks" offered. This close tie to southern Italy and Sicily extended to the extortionist societies of both regions. The Neapolitan Camorro, Sicilian La Cosa Nostra and the Black Hand were not neighborhood gangs so much as hermetic gangster rings that preyed on their own people. Economic abuse of Italians by Italians pervaded the character of their slum existence. The padrone lorded over the Italian children with Dickensian brutality, dictating their labor and collecting their earnings. The Black Hand had no compunction about attempting to extort from even the most famous national heros: Enrico Caruso, the greatest living opera singer of his day, a symbol of Italian pride, received the paper notes stamped with a black-ink hand demanding $15,000, a fortune at the turn of the century. Whether this model of internal violence reflected a fear of outside authority, alienation from their new home or merely the convenience of the nearest and most familiar target, the gangsters of the prohibition era seem to have preserved it in their motto, "we kill only each other" which prevented the mob from rubbing out its non-Italian political enemies. The worst violence of the Mafia has always been reserved for Italians, often for its own members. Jewish immigration was even more transformative. Following the anarchist assassination of Csar Alexander, blamed on Jews, pogroms spread through Russia and the Ukraine, spurring a mass exodus of unprecedented numbers. Poverty in close quarters breeds gangs and the Jews were no exception. At the turn of the century half the prisoners in Sing Sing were Jews. The German Jews, who had migrated long before during the German immigration of the 1820's and who had long since assimilated into American life, were so alarmed at this new face of Jewishness -- it cost them their welcome at the city's elite clubs and socials -- that they embarked on a crusade to educate these new arrivals, eradicate their slum language, Yiddish, and assimilate them into mainstream middle-class society. Their program succeeded in identifying Jewishness with education and the professions, and in nearly exterminating the only uniquely Jewish literary language. The Jewish and Italian gangs clashed on the Bowery not over politics but over illegal rackets. The earlier battle between American-born and immigrant labor gave way to turf battles between two equally recent arrivals. They fought over every enterprise available to them, perhaps the biggest and most available, the unions, with their sisters and brothers and fathers and mothers all members. Gangsters infiltrated the unions turning the already violent labor movement into a criminal racket replete with gang warfare. By the time Prohibition rolled in, the scene was set for rampant murder. Our image of the gangster today benefits from decades of prohibition-era costume dramas and latter-day mafia soap operas both fictional and real. It's the image of a blunt and arrogant suit, surrounded by minions, for whom no problem is so complex that it cannot be simply and effectively -- and permanently – solved: for whom conflict resolution is a bullet through the head. The Prohibition gang member was a gangster – a criminal who kills to maintain personal control in a kill-or-be-killed underworld. The bootleggers were engaged in crimes for personal profit, not political battles for the benefit of a party and a class interest. The gangster was an extortionist who thrived by subjugation. His proximity to murder lends him a mystique at once deplored and envied, admired but feared. One observer, watching Lucky Luciano stand motionless in the midst of a gunfight, called it "the coolest thing I ever saw." He meant cool-nerved, but one can hear, in his admiration of the outlaw, the modern sense of "cool" emerging. But that admiration had its limit. Outmaneuvering, outwitting and generally out-suckering the law, the gangster might be cheered as a working class hero, but he was never a working class leader. Gangs and politics had parted ways. Despite the pervasive presence of criminality in the slums, the ghetto was far from a depressed neighborhood. The most densely populated two square miles on the face of the earth, it was overflowing with culture and politics. At a time when New York was still a colonial backwater, its elites deeply conservative, the slums were a hotbed of the avant-garde, the recent immigrant arrivals from Europe bringing new European ideas and new European culture. It was a world center of anarchism, with the great Johan Most and Justus Schwab and their protégé, Emma Goldberg speaking and demonstrating in the streets and in the union halls, writing and plotting in their apartments and prison cells. Culture was irrepressible. Yiddish Theater, Lincoln Steffens pronounced, surpassed Broadway. All the radical new plays of Europe were eagerly mounted in Yiddish. Oscar Wilde's Salomé, too risqué for conservative Protestant Broadway, became Bessie Tomaschevsky's signature role. The first American school of painting, the Ashcan School, found a home in the free anarchist "Modern School," with George Bellows and Edward Hopper's teacher Robert Henri on the faculty, Man Ray and John Sloan attending as students. [In posting these, I see how much of importance I've left out. It was meant to be a mere brief forward to a book focused on criminality in the slum, but still, I wish I had dealt more effectively with the arc of history that led from the draft riots to the New Deal -- the working class asserting itself first through violence, later through Tammany Hall corruption and finally through the good-government principles of Al Smith and Belle Moskowitz that FDR inherited. It was the irony of New York that, owned by conservative Protestant elites, it came to be run by a reformist non Protestant working class, Catholic and Jewish. That working-class heritage endured until the last two mayors, whose election reflects a profound shift in New York's historical character and trajectory. With the disappearance of industry, the working class reform ethic has been replaced with middle-class aspirations. The city's political base has gentrified. And there's no mention of Boss Tweed, whom I find the most unjustly maligned figure in all American history. No question he was corrupt and his corruption lined his own fat pockets, but he was no more corrupt than countless industrialists and financial speculators of his day, and less corrupt than many. The difference between him and them: he didn't make his fortune abusing labor with an indifferent, calculated cruelty and bigotry almost unimaginable today, nor did he throw the entire country into depression and cause foreclosures ruining lives coast to coast as speculators did then and do now. Yet Tweed became America's icon of corruption because he was in the public eye as a public servant and because his voting base was Irish and Catholic and working class. His fiercest critics were Protestant conservatives who despised the Irish. Thomas Nast, author of all those cartoons reproduced in every child's history textbook, by all accounts was an anti-Catholic bigot, a fact that never accompanies the reproductions. If history is written by the victor, there's a deep lesson that we still haven't learnt in Tweed's national image, while our children still read a slanted text. Who won? The iron heel. Also no mention of the most underappreciated American, Peter Cooper, purest of principle, generous, brilliant, compassionate, visionary. Why isn't he in the textbooks? He's too good for them. And no mention of the almost comical progress of housing reform: the First Tenement House Act, requiring a window in every room without requiring that the window face outward -- the landlords cut windows in every room facing the dark hallways so the tenement dwellers lost their privacy without gaining light or fresh air; the twelve years it took for government to add the simple provision facing fresh air and natural light; the Second Tenement House Act giving us the air shaft, a worse disaster than no window. The enclosed pit gathered stinking garbage that led the thoughtless to believe that garbage was what the air shaft was meant for, although, in fact, removing garbage from an air shaft is a herculean and prohibitive task. The stench kept the windows closed. They were opened only to throw garbage out. Real reform came only with the 1901 New Law and the political correctness of its authors (the first instance of PC I've seen in the record). Rather than complain about the garbage, which would have been to blame the tenement dwellers themselves for their misery, the authors of the New Law emphasized the danger of the air shaft as a flue in fire. This seems to be an invention, although many secondary sources don't question it. Fires in my tenement -- the entire rear was burnt out when I moved in -- never went up the air shaft. Remember, the windows were kept closed because the garbage stank. The writers of the reform wanted the public to believe that the fault lay not in our immigrants, but in ourselves for building them such fire-prone structures. Political correctness, 1899, led directly to genuine housing reform, 1901. In 1921, the federal government imposed quotas on European immigration. With no new immigrant arrivals, and the second generation looking for any avenue out, the slums emptied quickly. Rents plummeted. Only marginals and artists found the neighborhood still attractive. St. Mark's Place in particular, with its proximity to long-haired, intellectual Greenwich Village, became a Mecca to the Beat Generation, jazz musicians, abstract expressionists and countercultural activists of every stripe. Eventually the hippies arrived, the Yippies, and Weathermen, and off off Broadway radical theater, experimental theater and transvestite theater; later squatters, punk rockers and skinheads alongside the Puerto Rican immigration that gave us the poetry slam, graffiti art and the urban mural. Throughout all this demographic shift, the anarchism and avant-gardism of the immigrant ghetto survived, not only in the political and social radicalism of the 50's and 60's but in the arts as well. It is no coincidence that murals, graffiti and blacksmithing grew and thrived in this slum where the owners of private property were absent and indifferent. Scrawling and painting on an abandoned wall, welding trash into fences, arches and canopies in an abandoned lot – all these are expressions of the fundamental anarchy that is the soul and spirit of the slum, the one space in the urban environment where the rules of property and propriety don't apply, the free space of expressive liberation for the have-nots who have only this space, the space that belongs, not to its owners, but to the people who live in it. Anarchy in its streets, anarchy in its art, anarchy in its rants, anarchy in its tenements and abandoned lots, anarchy is the slum. And the gangs, the organic order in anarchic chaos, played the crucial role, once again: it was ex-gang members who turned a Loisaida schoolhouse, abandoned by the city, into a center of the arts, Charas/El Bohio. Since 1912, when the Times observed that the story of the gangs had not yet been told, many versions of 19th century gang history have appeared. Asbery's Gangs of New York, popularized by Martin Scorcese's movie, Luc Sante's Low Life and Anbinder's Five Points, all have opened up the history of gangs to public view and influenced our thinking about them to the extent that it is hard to describe the slums of New York without reiterating their stories and their perspectives. Much of what I've described here can be found in greater detail in their narratives (and in Burroughs and Wallace's Gotham, a book that, long as it is, you'll wish never ended). Books on Mafia crimes and internal warfare, hits and rackets, investigations and trials, are too numerous to list in this space. Next to those, [Gangsters, Murderers and Weirdos of the Lower East Side] is distinctly different. Not a narrative, almost a reference, it comes close to being an objective account, skewed only by its focus: violence. Ferrara's compilation of disruption and murder in the slum will immediately bring to mind, to those who have seen it, the photographic work of Weegee, the freelance crime photographer who recorded, without bias or propagandistic intent, the murdered, mangled, stifled, stabbed, brutalized and bullet-ridden. Weegee's is a shocking body of images, tough and real, without the amelioration and soft filter of explanations and justifications, the diversion of armchair social theories or nods to the latest in political correctness. Like Weegee's work, Ferrara's is a cold, hard drink of fact, straight from the bottle. Grit your teeth. I'm all for crime prevention and community participation, but note the omission of "d" from the list of avenues. The flyer they propose to post all over the neighborhood concludes with "We will NOT tolerate street crime in OUR neighborhood." I guess I can understand and accept the preference for anonymity, but the omission of "d" from the e-mail address, "abcneighbors" raises implications that don't sit well with me. The emphasis in the poster on "OUR" neighborhood underlines that concern. Couldn't they find anyone from Avenue D to work with them, and if not, why not? There are many ways to handle adolescent group wilding and I'd like to be confident that the vigilante group's means of choosing are not a) based on an exclusion and b) an insult to part of OUR community. There is enough divisiveness here; no need for a crime prevention program to add to it. It seems to me that the first step would be to hold an open, local meeting which residents of all the avenues of Loisaida could attend. That could be the beginning of meaningful community action and dialogue. Looks like the city has it out for Ray's on Avenue A. DOH has posted a shut-down notice on the window. Apparently they don't like the authentic look of the place and want it cleaned up and yuppified. What a world. The Chinatown Working Group Town Hall will cover a number issues regarding the future of Chinatown including jobs, affordable housing, traffic, parking, parks, funding schools and concerns about history and culture. Help decide the future of Chinatown! The Chinatown Working Group is a newly formed democratic and open community-based planning initiative on the future of Chinatown. Our goal is to support the community's residents, workers, businesses and visitors. Chinatown Working Group's members are Chinatown's stakeholders -- LIKE YOU! Culture was irrepressible. Yiddish Theater, Lincoln Steffens pronounced, surpassed Broadway. All the radical new plays of Europe were eagerly mounted in Yiddish. Oscar Wilde's Salomé too risqué for conservative Protestant Broadway, became Bessie Tomaschevsky's signature role. The first American school of painting, the Ashcan School, found a home in the free anarchist "Modern School," with George Bellows and Edward Hopper's teacher Robert Henri on the faculty, Man Ray and John Sloan attending as students. Applications are available for 197 affordable apartments under construction in the Chelsea/Clinton/Midtown area of CB4 and 73 affordable apartments in Fort Greene Brooklyn. Details below. Applications may also be downloaded at www.phippsny.org/housing_app.html. Completed applications must be returned by regular mail only (no priority, certified, registered, express or overnight mail will be accepted) to a post office box number that will be listed with the application, and must be postmarked by June 14, 2009. For more information, visit http://www.nyc.gov/html/hpd/downloads/pdf/chelsea-area-manhattan.pdf. Completed applications must be returned by regular mail only (no priority, certified, registered, express or overnight mail will be accepted) to a post office box number that will be listed with the application, and must be postmarked by June 19, 2009. For more information, visit http://www.nyc.gov/html/hpd/downloads/pdf/38th-Street-West-Towers.pdf. ***DOWNTOWN GREENE APARTMENTS is pleased to announce that applications are now being accepted for 73 affordable housing rental apartments now under construction at 80 Dekalb Avenue in the Fort Greene section of Brooklyn. Rents from $489 to $803 for incomes between $17,259 and $38,400. Applicants will be required to meet income and additional criteria. Completed Applications must be returned by Regular Mail ONLY (no priority, certified, registered, express or overnight mail will be accepted) to a post office box number, or its equivalent, that will be listed in the application, and must be postmarked by July 5, 2009. Applications postmarked after July 5, 2009 will be set aside for possible future consideration. Applications will be selected by lottery; applicants who submit more than one application will be disqualified. Preference will be given to New York City residents. Current and eligible residents of Brooklyn Community Board #2 will receive preference for 50% of the units. No Broker’s Fee or Application Fee Should Be Paid At Anytime in Connection With These Applications. From the 1840's on, the battle raged between the Protestant industrialist owners of the city and the immigrant – and largely Catholic – working class gangs. The immigrant cause advanced with the election of Tammany Hall Democrat and working class champion Fernando Wood, only to see the jealous Republicans, in control of the state government, undermine him from Albany. In 1857, while Wood was impressing both the downtrodden in the slums and wealthy progressive reformers with his programs to fight poverty and provide respectable employment – eighty years ahead of the New Deal – Albany conspired to shorten his mayoral term and replace his entire police force with a new one of their own. Standing firm on his city support and refusing to disband his municipal police, Wood forced a riot between the two police forces on the steps of City Hall. The military intervened to issue the mayor a summons at bayonette point and arrest him for inciting the riot. The rest of the summer saw these two police forces engaging and subverting each other, turning the city into a lawless battleground. Tension broke into mass violence on July 4th, always a testy moment in the sweltering heat of midsummer New York. Responding to an incident in a bar on the Bowery, the city's busy commercial entertainment district, police and Protestant gangs attempted a full-scale assault on the Five Points, the Irish residential quarter, where the gangs and their families lived. Entering at Bayard Street, they attempted to push through the center of the neighborhood. Pelted by brickbats thrown from the rooftops, the invading Protestants were held at a stand-off. They piled up makeshift barricades out of carts and barrels, and brought out their firearms. By the time the military arrived the next evening, at least twelve were dead (perhaps many more dead had been carted away by family and neighbors), and both sides had exhausted themselves. The Times called the invasion a riot and blamed it on the Irish.